Reading time or any numbers in binary is not difficult. It is the method that computers continue to use today. There are only two "states" or conditions for any input or output to be in, either a "1" or "0" hence "bi"-nary. 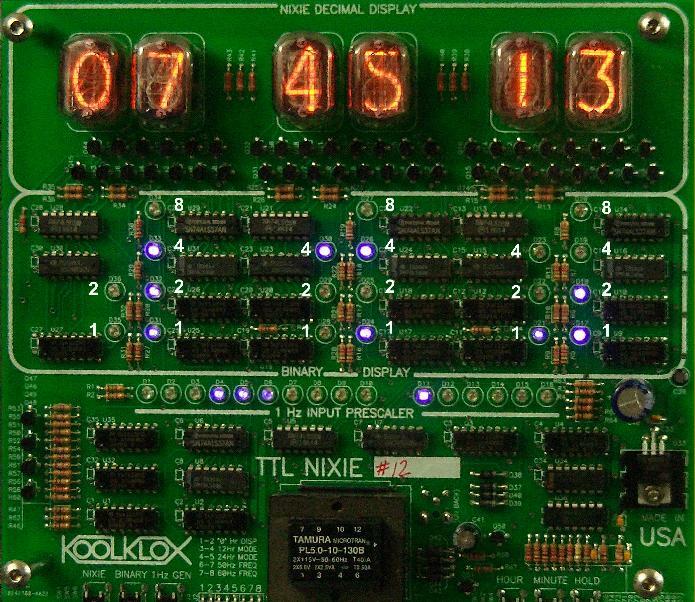 Looking at the "BINARY DISPLAY" LED's in the above picture, there are white numbers 1,2,4, and 8 next to the LED's. These indicate the significance or value for each specific digit. If we add up the white numbers next to the lit LED's in any given row they will equal what is displayed on the nixie tube directly above it .